Written just two years after being driven from office as a diplomat, The Prince was originally intended to be part of a larger work entitled “On Principalities.” This short book is the only extent part of that original text, first published in 1532. Chapters 1-11 examine the various types of principalities or principates. The text offers examples of each type, ranging from the ancient world to those contemporary with the book. Machiavelli offers histories and strategies of governance from each example. The chapters are quite short, some only a few paragraphs in length. One of Machiavelli’s primary ideas is that a hereditary principate (this will be distinguished form other forms of principates) can only be conquered when one has first established a foothold by living in that principate, or by establishing a colony in that territory. When annexing territory through conquest, Machiavelli explains, one must do so with force and one must “extinguish the line of the prince” in the existing territory. In this way the conqueror can prevent an insurgency against the conquering prince. Machiavelli cites the Roman strategy as exemplary of this principle. Far from being an act of aggression, conquest is a “very natural and ordinary desire.” He speaks highly of Alexander the Great and those who followed his example as great leaders and conquerors who achieved tremendous success governing the territories they conquered. Chapter 6 lists several examples of great men who conquered territories in the ways Machiavelli describes. He names Cyrus the Great of Persia, Romulus of Rome, Theseus of Greece, and Moses of Israel as conquerors who gained power and territory through strength of arms rather than divine assistance. This is crucial because the prevailing belief at the time was the kings and conquerors were endowed with power by God, not human virtue, cunning, or strength. 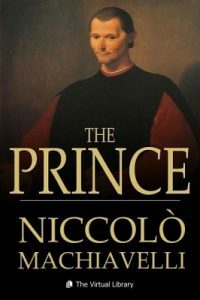 Machiavelli states that in every case, “Armed prophets conquer and unarmed ones are ruined.” Machiavelli singles out King Agothocles of Sicily as one great ruler who attained power by displays of his virtue, although he was in fact treacherous and ruthless in the very ways Machiavelli describes as essential for conquest. He is critical of those rulers who inherit their power and authority. He makes the case that these men inevitably lose their grip on power because they lack the skills and treacherous qualities which ensure great power. These rulers may inherit power easily, but the authority behind that power is just as easily lost. In Chapter 11 Machiavelli turns to “ecclesiastical principates,” which is his term of the authority exercised by the Catholic Church. He makes the case that the church is a temporal power like any other principate, one which rules through the same means of treachery and force as the others. He even states that there are subjects who are not governed by the church. Chapters 12 through 14 treat the problem of political enemies and how they are to be handled. Enemies must first and foremost be treated with military force. No other means are effective. For example, negotiations and appeasements are doomed to failure. The proper treatment of political enemies is dependent on a rulers military strength. One who maintains his own army is strongest and has no need of laws. He may act with impunity toward his enemies. If he must depend on the military strength of others then he is left with mercenary forces and these are the least effective. Machiavlli states that “those arms are disunited, ambitious, without discipline, unfaithful; valorous among friends, cowardly among enemies.” Mercenary forces are dangerous and when a ruler depends on them he is forced to rely on the strength of others, and this compromises his own strength. To rely on the army and forces of another political leader is equally dangerous. Machiavelli offers the example of Cesare Borgia who relied on mercenary forces for a time then began using his own military. Borgia experienced losses and a lack of loyalty with mercenaries and the military assistance of others, but he gained power and victory once he utilized his own power and might. Machiavelli’s primary example is from the biblical King David. He recounts the tale form the Old Testament in which David prevails over his enemies by relying entirely on the force of his own strength and military power. Chapters 15 through 23 deal with the ways a prince should treat his own people and subjects. He makes the case that the prince may in fact possess the virtues of a ruler, but what is important is that he make a display of these virtues even if this display is false. It is more important to give the illusion of virtue than to possess virtue. Generosity, for example, is a fine virtue for a king, but to actually be generous is detrimental to the power of the prince. A great ruler should not deplete his wealth through his generosity. However, the prince may be generous with what he has taken from others. He gives the examples of Cyrus, Alexander the great and Julius Caesar as powerful leaders who were generous with the spoils of their conquests. This section on the treatment of the prince’s subjects concludes with the famous passage in which he makes the claim that it is better for the prince to be feared than loved. He qualifies this by saying that it is possible and preferable that the prince be feared but not hated. If the subjects fear and hate the prince, there is a danger of rebellion. But in order to command loyalty and respect, the prince must instill fear in his subjects. He coins the phrase “pious cruelty” to describe the proper demeanor of the prince. A great leader will use religion to give him the appearance of being pious, and he will be ruthless in order to maintain loyalty. Even among his closest associates, the prince must maintain the demeanor of pious cruelty. He should keep a few close associates who will speak the truth to him, but all others must be kept at a distance. Chapters 24 and 25 deal with the rise and fall of fortune as it pertains to power. Machiavelli has no sympathy for those rulers who depend on chance and fortune. He is admant that a prince sustains his power by being proactive and even impetuous. This section contains the famous quotation: “it is better to be impetuous than cautious, for fortune is a woman, and if one wishes to keep her down, it is necessary to beat her and knock her down.” The final point here is that a prince must be ruthless in the face of adversity. The final chapter of the book breaks with the thesis of The Prince. It is primarily a political tract in which Machiavelli makes a personal patriotic appeal for all Italians to expel foreign enemies from their native land.